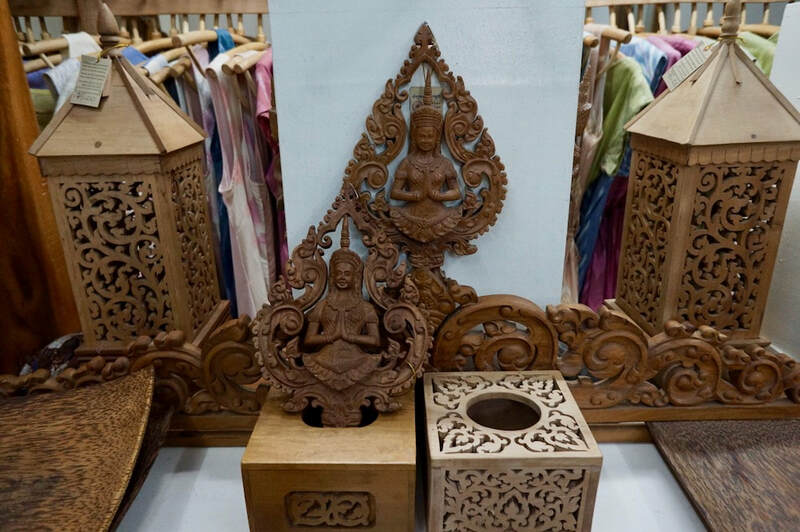 Come to Cambodia and buy some stunning handcrafted take aways that will perk up your wardrobe, be great talking pieces and form the base of great memories. 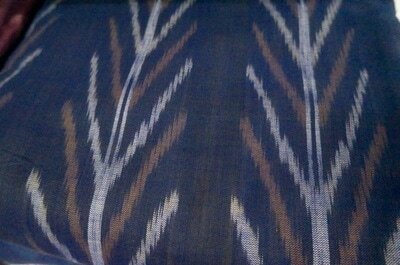 Many of these items are all hand made especially the woven fabrics including silk and cotton. You can see in the picture below the many cotton and silk fabrics and scarves that are handwoven by many villagers all over Cambodia. And these items that you buy in Cambodia have got a very strong feel good component. Many of the shops are fronts for NGOs helping people in remote villages produce things that you'll want. 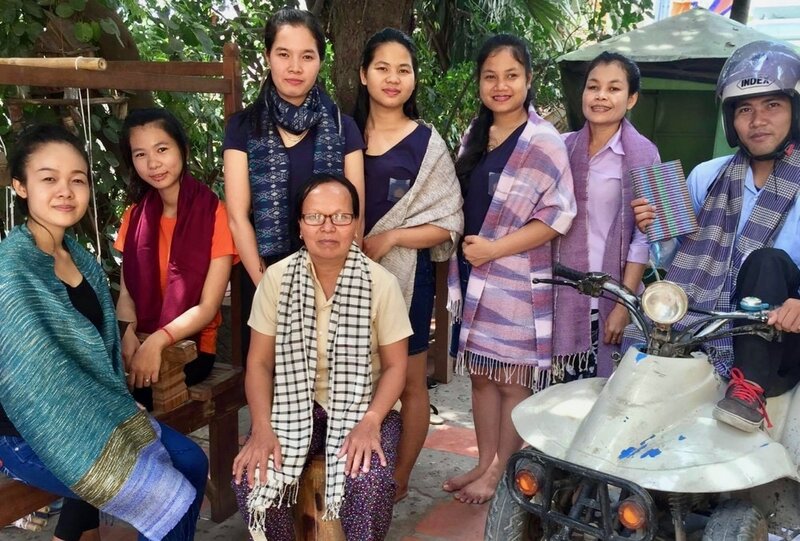 Although Cambodia has come a long way in the last 15 years, the level of poverty especially among rural women is still heart breaking and shopping with these NGOs is a great way to help people earn their way up the ladder. Here are some of the Cambodians you will be helping when you buy things from there. What are Some of the Best Buys in Cambodia? There is a whole range of hand woven items - from fabric to accessories made of silk and cotton including bags and wallets, shirts and ties even whole suits in all the colours of the rainbow and all the designs that you can bring with you. 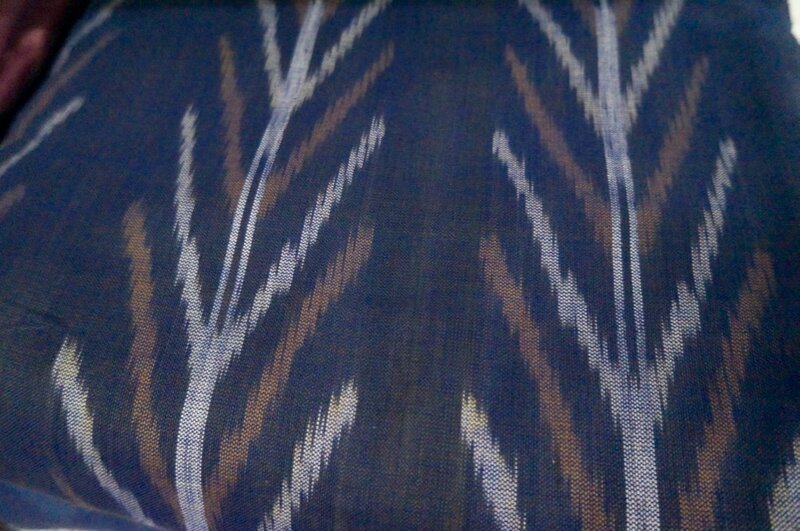 One of the most popular hand woven items people buy in Cambodia are scarves. Scarves really add a flare to most women's outfits and these handwoven treasures will take your breath away. You can easily buy these scarves in the market and they're cheap. As you go around Cambodia, you'll see the locals wear these. Hand woven fabrics are also good buys in Cambodia. Many women now stop weaving and go to work in the factories instead. Factory work give them steady pay and more than what they can earn from weaving. This skill will just as soon be forgotten. Some NGO's work in preserving this and help the weavers sell their hand woven fabrics. 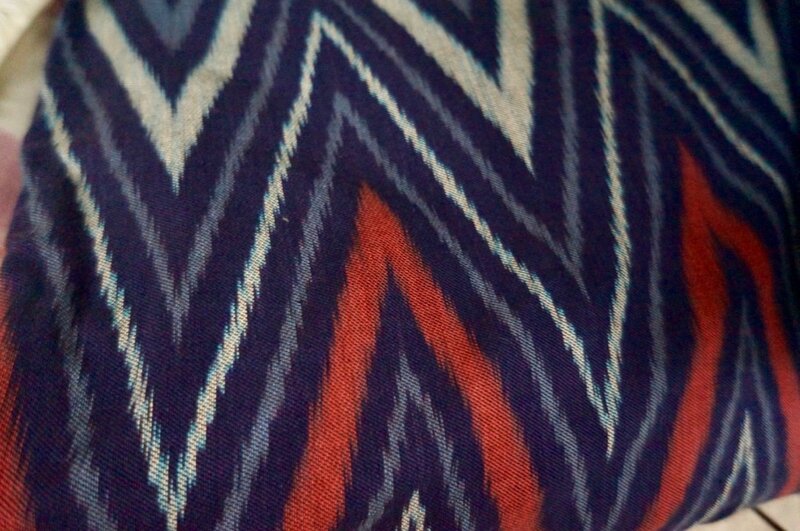 There are several in Phnom Penh but two of those selling some of the best woven fabrics are Watthan and A.N.D. in Street 240. Silk products can be found everywhere but Artisans d'Angkor with stores in the airport, the capital and Siem Reap has a well deserved reputation for exceedingly high quality and some imaginative design. When you visit Siem Reap, you can visit its silk farm and workshops and discover how the products are made. 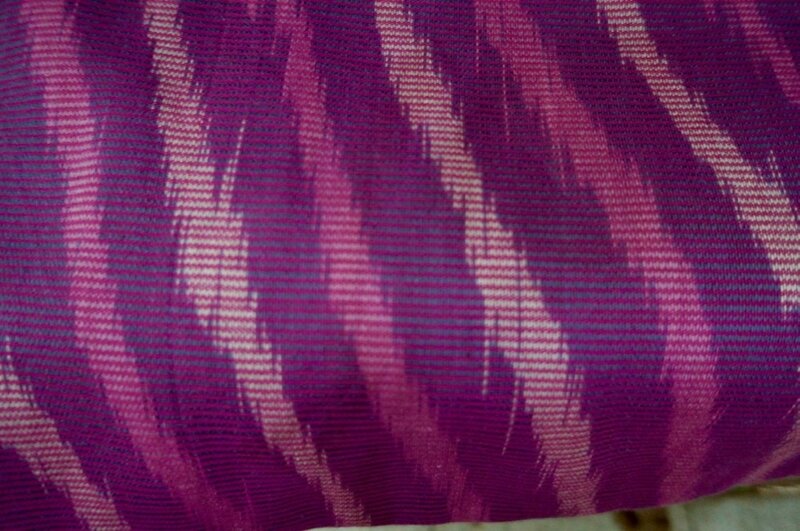 If you're interested in knowing how these silk fabrics and products are made , Artisans D'Angkor has organized a shuttle from Siem Reap downtown so instead of the long rough journey we have to make in the past, you can have this whole experience in just a few hours. The prices are a bit higher than those sold by some of the street vendors but here, you know the products are real silk, are truly Cambodian and are really durable. Items to up style your home are easily found in Ambre and Tabitha and once again, the Artisans d'Angkor. 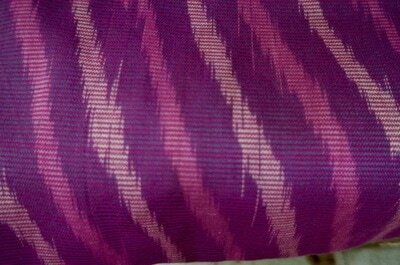 For silk fabrics in Phnom Penh, get to Tabitha, or either the Russian Market or Olympic Market. Happy Silk in St. 178 sells well designed wallets and bags and along with Tabitha offers some of the best colours I've ever seen. 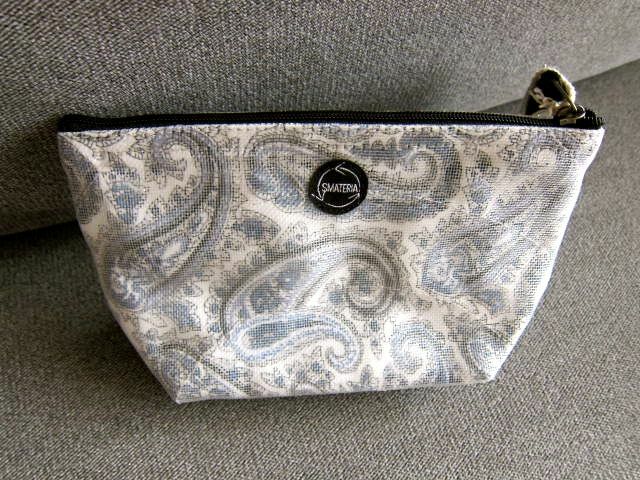 Hand made silver accessories are beautifully designed and crafted in many adjoining stalls in the Russian market. It's hard to imagine that such fine work can come from such rough tools but the artisans are masters. It is not unusual to find wood carvers setting up in the street with the block of wood held in-between their feet as they carve intricate patterns and statuettes. In St. 178, the carvers on the sidewalk are busy and whatever they produce is for sale. You can even make them copy one from a photo. As for canvas art, the intricate evolution of the Asian tradition with the inspiration from the French colonial period has led to some unique and truly remarkable work that is still well priced and will be a great conversation piece on your wall in Cleveland or Regina. How big is your suitcase? How big a Fedex box can you get? The statues and carvings done in the tradition of the height of Khmer culture at the end of the 1st Millennium are just amazing. 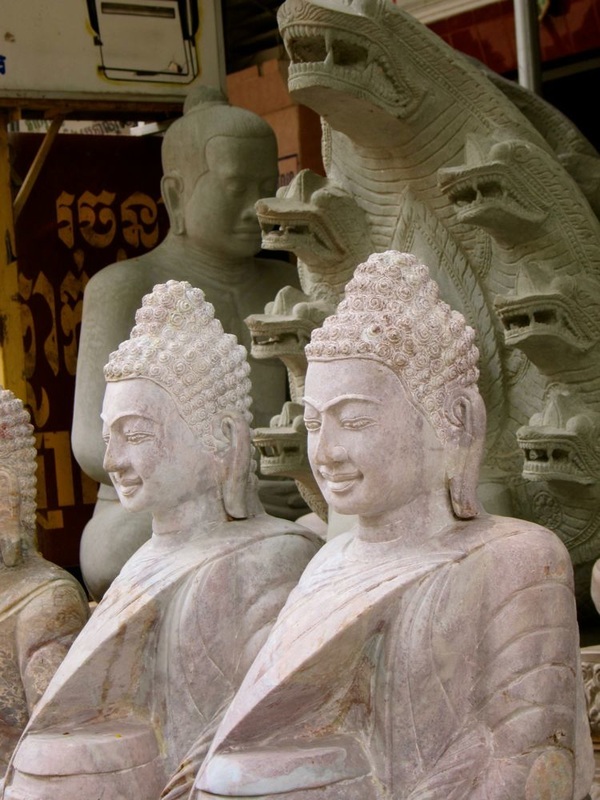 Khmer Buddhas have a warmer smile than those from other Buddhist countries and can add a feeling of peace and timelessness in the corner of your home or garden. The carvers almost encircle the Palace in Phnom Penh but some of the most beautiful work is found once again near Angkor Wat in Siem Reap. The French know about food and for them Kampot pepper is the best in the world and have been used by their top chefs since the 1800s. Kampong Speu has perfected a unique way of making palm sugar and you must try this caramel glory, not too sweet, so, perfect for your coffee. Maybe Mondulkiri or Ratanakiri coffee will catch your fancy, both offer a deep rich unique flavour. The one I often use is The Three Corner Coffee packaged and quality inspected by the White Lotus Project, a social enterprise committed to the development of Cambodia. Believe it or not, you can buy quilts of fabulous designs made in villages where they are a main form of income. Or perhaps a bamboo bycycle or individually designed pottery running from unglazed to the full inventory of finishes. Mekong Quilts at St. 240 is the best. When you go there, look at the most fantastic bycycle on display, the Bamboo Bicycle. Several social enterprises have come up with a bycycle you want to look at and ride in. SmartCraft Tire Inner Tube Wallets and Bags. These are my favourite. Smateria leads in design and fabrication of a whole range of products inspired by Italian designers. 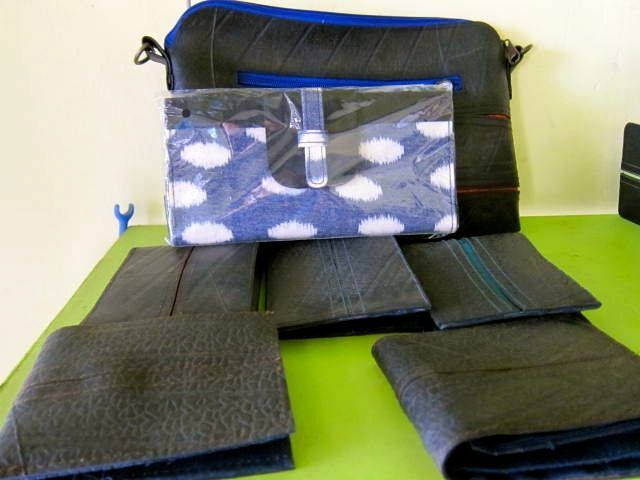 Others have followed Smateria and use recycled materials like tires or rice bags to make, wallets or handbags and other accessories. 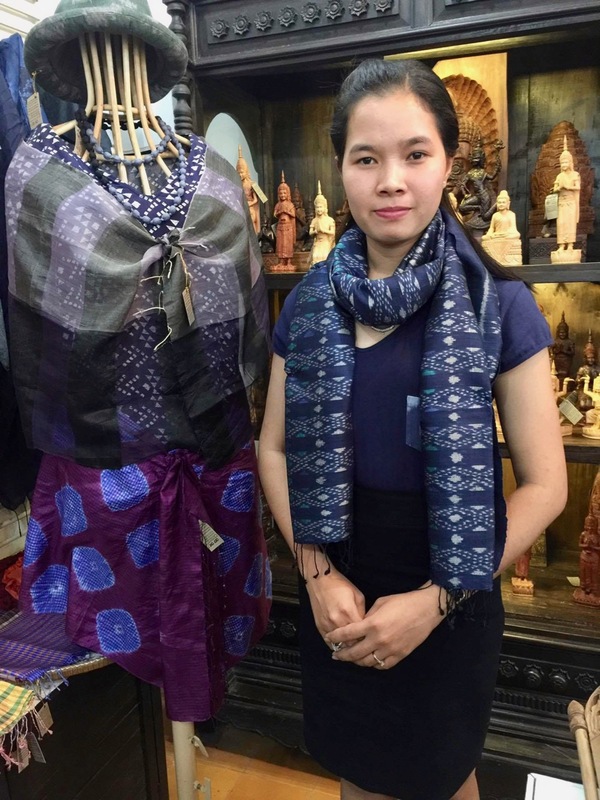 Many of these recycled products are made far away from Phnom Penh by men and women along the Mekong and they have a whole variety of designs that reflect the materials available and the imagination of the villager. If you've got your own idea for a design, bring it along and see what these crafters can do with them. The full range is here and offered from tiny little jars to fairly serious commercial containers so you can tuck natural oil from lemon grass, jasmine or even cinnamon to elevate your impact from highly sophisticated to a Danish pastry. Hey the grand kids might love it. Many social enterprises have created beautiful bead bracelets with a message like, It's Not Ok, to stand up against human trafficking. Another one, Craftlink, has bracelets made from land mines. It is a great way to support social causes. You can buy CDs but sometimes you'll be disappointed with the copies. Besides, you want to support artists. Check out places where to shop in Phnom Penh. 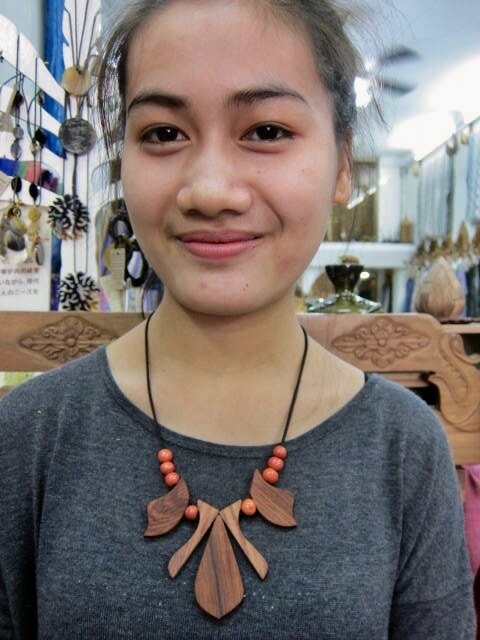 For more Cambodian artisans products, visit the website of the Cambodian Artisans Association. Have you been to Cambodia? What other products would you recommend? If you're a Cambodian, what other products would you recommend?